Time has gone by so quickly and I have sort of lost track of where we are. You get sucked into a certain lifestyle so quickly that you forget you are supposed to be on the move! I have spent much of my spare time writing up excel sheets that the managers, we have put in place at our business, need to complete and submit to me on a monthly basis. Just so that I am still in the loop and have peace of mind. Things at the office are progressing very well, and I am very pleased with the Management team. My little champions! We had a wonderful dinner at a restaurant, Pescador, in Vilanculos, with Robert and Phillipa who was also celebrating her birthday. Its quite unbelievable that a restaurant of this quality and status is here in Vilanculos nestled between the shacks and dilapidated houses and buildings on a dusty sand road in town. 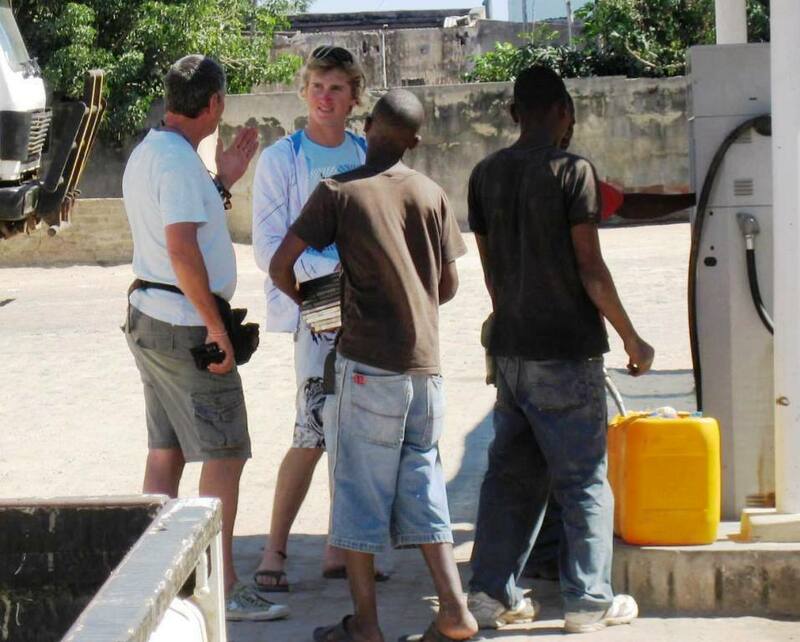 Kev did another fuel run with Robert to refill what we had used on the Bassas route, and Robert was ‘Mr Exceptional nice guy’ where he lifted and carried all 200l of fuel for Kev, because he was worried about Kevin’s back. He even posed for me when I told him his picture would be in my newsletter. The bods not half bad hey, ladies? This picture is especially for you Zanna! 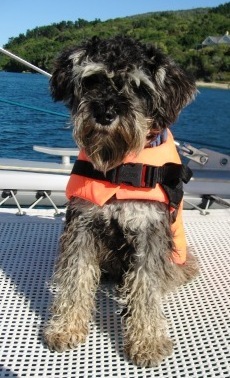 As luck would have it, we heard about a brand new tender that was for sale in Vilanculos by a fellow yachtie. We went into town to Hendricks house to view the tender and it was still in its packaging unused. What a bargain we got! A 3.6m tender with rigid floor, a funnel type thing underneath the floor to drain away any water inside and its thermo bonded or whatever? Its beautiful and when I saw it my eyes lit up, and I didn’t need any convincing. Our existing motor fitted and was suitable so it was goodbye Bakkie and welcome Land Rover (henceforth known as Landy). We put the bakkie up for sale and two of the lodges are interested and are coming to view him, little do they know, she has a history! A very pleasant chap, this Hendrik was. He gave us coffee, showed us his place of abode, had a chat, pumped her up for us and offered to drive her in his trailer to the waters edge. He is from SA and does solar power installation here for 6 months and then back to SA for 6 months. I think Kev is secretly very chuffed to have a more luxurious mode of transport although he is getting very fond of Lexy and uses her very often. Our next destination is Madagascar. The plan is to cross the Mozambique channel via Bassas then on to Juan Da Nova (French territorial Island off the west coast of Madagascar) then on to Mahajanga in Madagascar as first port of call to check in. This routing of 765 nautical miles will take us 7 x 24 hour periods of constant sailing at a steady speed of 5 knots. We plan to stop over at Bassas & Juan to rest for a day or two between each waypoint, because there are only 2 of us doing shifts every 3 hours and fatigue/irritability/gat-vol sets in quite quickly from lack of sleep and boredom. So all in all it should take us about 11 days to cross to Madagascar. Our planned departure date is Wednesday 25th August 2010 or first suitable weather window thereafter. 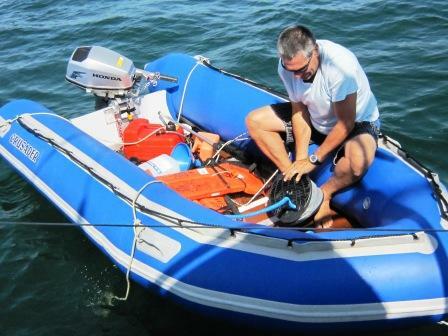 We have placed an order for spare parts with Kev, our Boat builder. One of our Aerogen wind generator blades got caught up in the excitement of the fishing episode at Bassas so we need a new one before we leave, a spare salt water pump for incase, and some other smaller things. We also dropped our tender anchor overboard by accident. It will take about 10 days for all the spares to be sourced from the various suppliers by Kev and then it will be shipped to our Joburg office where Jules will repack, and ship to us in Vilanculos. To sail to Madagascar you need a cruising permit (which you can only get at the Madagascan Embassy in Cape Town or via email to them), and a visa from the Pretoria Madagascan Embassy (which can be obtained on arrival, but your passports get taken and sent by road to Antananarivo for the visa). We decided that while we were waiting for the spares from Knysna and the cruising permit (you need this to apply for the visas) we would go to the Kruger for a few days and on to the Pretoria embassy (takes 24 hours for the visa). At the same time we would be renewing our Mozambican Visa by exiting and re-entering the country before the 30 days expiry date. Whoa, and I thought I had left all the time management, bureaucracy and paperwork behind me! Having a yacht is like having pets. You always have to have a babysitter when you need to go away. We were humming and hahing about what we should do about babysitting catatude while we were away, when Ian from Yacht HQ Simegror called and said he was in Vilanculos for the next 2 months. We told him of our plans and he offered to babysit her for as long as needed. How nice was that? An extremely competent babysitter for Catatude. We were very happy to handover to Ian and left on the flight bound for Maputo with whatever warm clothes we had onboard. He would take her from anchor at Vilanculos town to anchor at the Dugong Sanctuary where HQ Simegror and the lodge that he is managing, was. 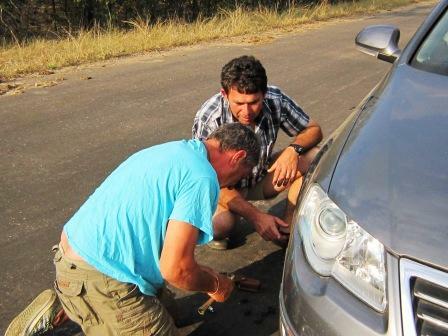 We hired a car in Maputo and proceeded across the border and arrived at Crocodile Bridge camp in Kruger just before gate close. We spend a very relaxing 5 nights at Kruger, moving from camp to camp in a northerly direction, checking on the PC every day for the reply email correspondence that we were waiting for, from the Madagascan Embassy granting us cruising rights. Without this we couldn’t apply for our visas. So frustrating ! We were so lucky, we saw a leopard hunt a large Pumba, and drag it about 40m and then up into a tree. The squealing of the Pumba was terrible. Shame I felt so sorry for it. 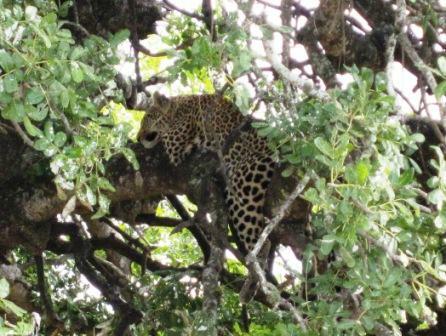 The baby leopard was sleeping in another tree across the road waiting for Mom to get dinner. It must have been leopard week as we saw another 2 on separate occasions later in the week. Anyway we finally got our email confirming that all was in order and we were accepted as cruisers in Madagascar. It was a long weekend (women’s day) which we didn’t even know, and the embassy was to be closed on the Monday, the park was fully booked so we proceeded to Tshipese (natural hot water spring near Messina) for the long weekend and then straight through to Pretoria to get our visas. It was prompt and efficient and 36 hours later we had our visas and proceeded straight to Nelspruit to collect my credit card, which was due to be collected from Nedbank Nelspruit. Needless to say it wasn’t ready when we arrived and we had already booked our flight from Maputo to Vilanculos, so we decided to have it sent to Joburg for Julie to collect. We left our hotel early in the morning and drove to the Komatiepoort border post, ready to drive through, proceed to Maputo airport, return the Avis car, and boarded our 12pm flight back to catatude. We got there and were shocked to see the queue of cars all the way down the hill. Ah man, they are on strike again! From that minute on things just went pear shaped! We finally got through the border 3 hours later, had a puncture, got a speeding fine on the Moz side, missed our flight and found out that the next available flight was on the 21st of August (7 days later!). Kev was Mr grumpy and moaned non stop all the way about how we would now have to stay in Maputo for the next 7 days, how I should have got up earlier, how this country is getting worse and worse. Bla,bla,bla. Being the eternal optimist, I managed to find us a flight to Beira (further north than Vilanculos) that evening at 18h00 and then a flight from Beira to Vilanculos the following day at 10am. Not too bad I thought only 24 hours later than originally planned! We had lunch in Maputo at the yacht club and by 8 pm we were in Beira. Imagine you wake up preparing to fly to Vilanculos and ending up in disguthting Beira! What a dump! terrible, terrible, terrible. We found the only decent hotel in the centre of town (which was quite nice but a bit on the glitter palace side) and after a good nights rest and early breakfast we were at the airport, ready to fly to Vilanculos. The flight to Vilanculos was a mere 35 mins and we had a good aerial view of the archipelago as we came in to land. We were happy to see Catatude from the air nestled comfortably in the Dugong sanctuary next to HQ Simegror. It had been 10 days since we had left her and felt like much longer. Phillip was there to collect us from the airport and he dropped us at the beachfront where Ian was waiting for us in a luxurious high speed fishing boat! We went with Ian to the local market to get some fresh veg and salad, rolls and cold drinks and then back to our ride. 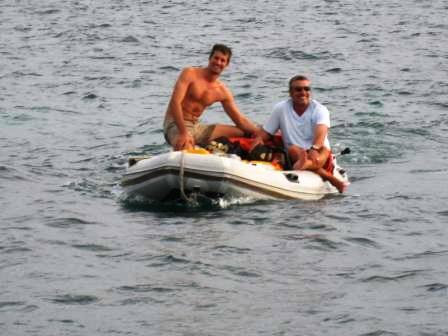 What a spoil, no Lexy, or Landy to schlep all the luggage into, but a boat boy to carry the luggage and fuel and not a foot wet! Drinks on route, a soft cushioned seat and a driver! As we got closer to the Dugong Sanctuary and Catatude was in sight, I saw the grin Kevin flashed her! She has definitely found a special place in his heart. We stopped aside Catatude, transferred our luggage and were given a tour of the beautiful lodge. The chef was expecting us and had prepared a fantastic prawn stew for us, which we were very grateful for, as we had last eaten breakfast in Beira, and were starving. We returned to Catatude and settled in. Had dinner at the lodge and slept like logs. So while we are waiting for the parcel of spares, we are busy with boat preparations. I am updating the newsletters, (ja,ja I will try to be more regular in getting newsletters out on time) and thank you to the 11 people that wrote to me to nag, nag, nag, it really helped to pressurize me to complete the previous one. Blush, blush. It’s become a little embarrassing to see how many people are following us on our journeys and reading my newsletters which were originally intended for family and ADE staff. You must all think I’m a little cuckoo? Well, I am. Its very frustrating being “ïn town” but not having cell phone signal because it is difficult to download pictures and publish the story on the web when the connection is soooooooo very slow. Were talking, edge 1 bar slow. yes, it's me again, Salty. Last night OK was telling us all the stories from your "Bassas" adventures. Man, I envy you. I am also quite pleased that my qualities have finally been recognized and that, hence, even a yacht, was named after me as "Salty Dog". Coming to think of it, OJ and OK took us on Sunday to the lousy Hartebeest dam. While OK would have allowed us to get into the water, OJ raised all hell and made us walk with her along the "beach". We also would have liked to see some whales instead we only saw algae. But nevertheless, it was not such a bad outing. OJ brought water along for us, but it was sparkling water and she didn't know, we only like still water. Surely, she should have known that! Oh, and OJ fell off the ladder last week! On the right hand side her body is bruised from top to bottom. Every time I jump on her ( while improving our lap times) she screams somehow sissy-like. Last week OK and the boys came back from their "Baobab-Tour 2010". If their web master kept his word then there should be an update. (www.big-five.co.za). You know what always baffles me, is that their final accounts show, that the bill for the booze is higher than the one for accommodation! Pepper's and my life follow a more relaxed routine, while our cousins Mauve and Jagger hang around the TV, we join OJ when she fuffles in the garden. We are also still trying to improve our lap times between the two lounge suites. Remember the high bar stools at OJ's breakfast nook? I can now , from a standstill (!) jump to the top. You try that !! We also changed our sleeping pattern. Pepper doesn't sleep anymore at OK's head, she found it safer to move to his legs. Apparently there she is protected from his arms when he is turning around in his sleep. I also found a better place, I wait until Jagger gets out of his basket during the night, and then it's mine. He is too scared to chase me and then sleeps on the floor next to OJ. There is not so much more to tell you, Tanya and Ryan are moving to their new house at the end of the month, and that is it! We took Lexy to the beach to go and explore the Sanctuary today and then Ian called us to show us the viewpoint from the highest point on the mainland. We have yet to see a dugong! With Ian, Vernon and Kyle we left in a Jalopy Land-Rover that was very tired. (all the vehicles here are very tired! The roads are just as tired and all vehicles have some sort of make-shift contraptions on them to keep them running. (plastic bags as hose clamps, springs hanging out of the bottom playing tunes, etc etc). Oh and all cars have a 2lt coke bottle with emergency water on their dashboards. We eventually got to the highest point just after sunset and I managed to get a few photographs of the view out to sea and into the archipelago bay. I also saw that if we had sailed up the coast as close as we did from Knysna to Durban that we would have hit the reefs. It was great to see it from the aerial point of view and I think it is poorly charted as to the depths, drying out sections and reefs. Today Kev fixed the tender transporting seat (the section on the back of the boat that Landy sits on whilst we are sailing. He had to modify it somewhat as it was originally made to suit the bakkie which had a much deeper V hull. We also tightened the shrouds that hold the mast in place, as they had become quite loose with all the miles we have done since Knysna. 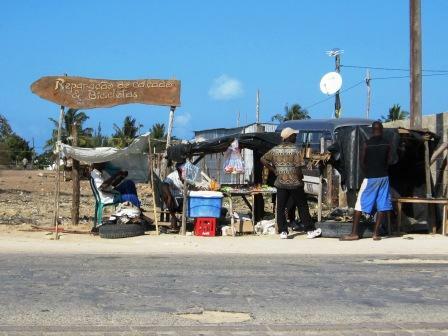 The locals traded fresh rock-cod and those little famous LM prawns. The prices here are much cheaper than at the mainland, but I watched as they threw a big dragnet today for their daily catch and all they caught in the huge net (about 100m long) was 1 crab. Unfortunately the area cannot sustain the constant plundering of the seas and although you see many, many tiny fish they just never get big enough to reproduce. Its rather sad as this place could be a tourists mecca, with enough jobs for many in the community. But without fishing the communities have no food at present, so its a rather sad situation. They rely on the dhow’s going out to sea and catching on the reefs (yes, they spear fish on the diving sites like 2 mile reef). We will be leaving the sanctuary tomorrow, and plan to anchor outside Vilanculos Beach Lodge, so that we can top up our fuel and fresh provisions before we go. Yahoo, I cant wait for proper 3G. I’m gonna drive you all mad with emails and phone calls tomorrow! Phillipa and Robert of Salty Dog came to bid us farewell. They plan to leave here for Cape Town onext week. The need to be home real soon as they are getting married in Cape Town in 5 weeks. We bid them farewell and promised we would try to attend their wedding. They have been such help to us and we have become friends. Ian accompanied us back to Vilanculos, to show us the channels to use on route back to Vilanculos . We stopped at Dugong Lodge, as we had heard that the lady running the lodge had a sea aquarium, that she stocks with fish that she saves from the nets that are dragged in by the locals. What a stunning lodge, and what a cute lady. Very passionate about saving whatever she can from the nets and returning them to the sea. (She can also only save what the locals discard as inedible). Her tank is fed by a pump directly in front of the lodge in the sea. 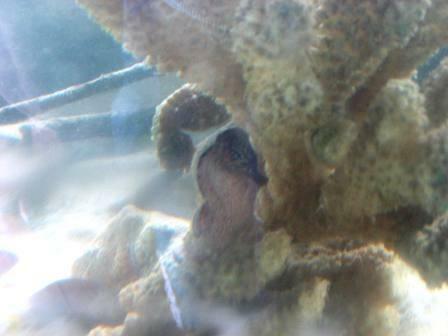 She has a moth fish, a small crayfish, baby trumpet fish, and some Sea horses, which are heavily pregnant. Her last seahorses gave birth to, she estimates about 300 babies. The males carry the babies. There are various other fish that I cannot identify, even though I have searched through all our fish identification books onboard. 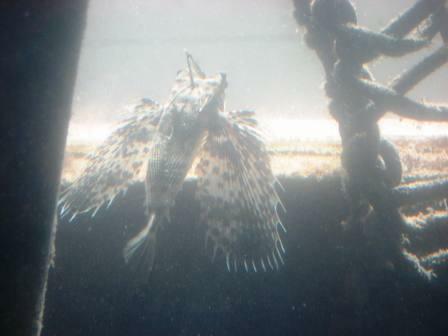 Sorry about the poor quality of the picture but the tank had just been flushed. We met two of her guests, SA springbok cricketer, (I forget his name, but he has something to do with being the spin bowler?) and his wife, who were on honeymoon. Continuing on our way we had a very good sail past Bangue and Margaruque Islands and arrived just after sunset. 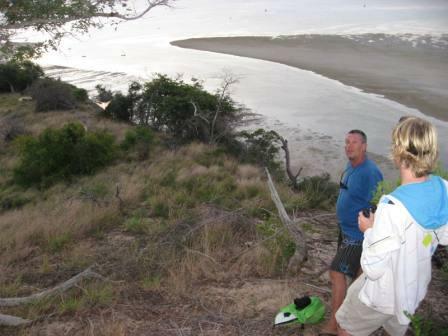 We dropped anchor and as Ian was sleeping over we enjoyed a most pleasant braai with him for dinner. Ian left at 6am and once again Kev checked the weather to find the ‘perfect weather window’ for us to continue to Madagascar. We spent the rest of the day going the boring ugly chores, like stainless steel polishing, washing the tarpaulin covers etc etc. And Mom, you will be so pleased to hear that I actually, bit the bullet, and made cinnabons. I didn’t expect much and Kevin was dreading the moment that they came out of the oven, because he knew he was the only one around to test-drive them. 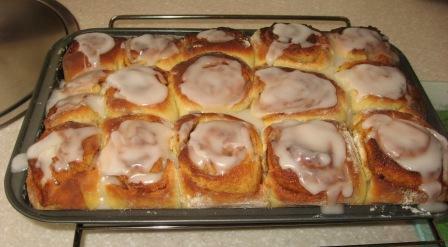 But, the freshly baked smell came wafting through and they came out beautifully. They tasted even better. (well that what he said, and I thought so too). I never though it would come to this, where I am actually doing a domestic chore that wasn’t necessary. I’ve made a mental note to keep myself in-check should I get any future impulses. Well, it looks like the weather will be favourable to leave on Thursday at high tide around 5pm, so we are basing everything on that for now, and getting ready to depart. There’s not too much to do but in deepest darkest Africa a little takes a long time. We did the fuel top-up, visited the hardware shop in town (very good selection of hardware - if only we had known before ordering things from Joburg to be shipped here!). These small dusty roads, hide many things and the constant begging and roadside trading will still drive me to drink! No thanks is just not in their vocabulary. 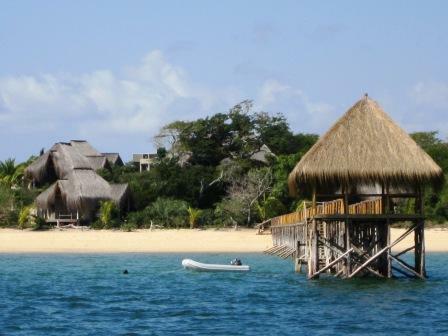 The anchorage here outside Vilanculos Beach Lodge is getting a bit crowded! There are now 8 catamarans anchored alongside us. We have still not received our UPS parcel that left Joburg on Thursday last week! Thank goodness we now have 3g signal because I phone and nag Maputo UPS constantly. The tidal range here is something that practically rules your life. Everyday you have to consider when and by how much the tide is going to change. This anchorage is not the best. The wind picks up every afternoon just as you are returning from lunch at the lodge, with your groceries, to blow sea spray over your provisions and hair, whilst in the Landy on the way back to Catatude. Today we just touched the sand bed at low tide, so we will need to move to deeper water tomorrow as it is spring tides and tomorrow the low tide is 0.6m. After reviewing the weather again, Friday is looking like a better option now so perhaps we will spend one more day here. But will we get our clearance certificate and parcel by then ? Today was one of those, I hate Africa days. We still haven''t received our clearance for Catatude to leave the country (which we need to check into the next country) - Eh, collect in the morning! 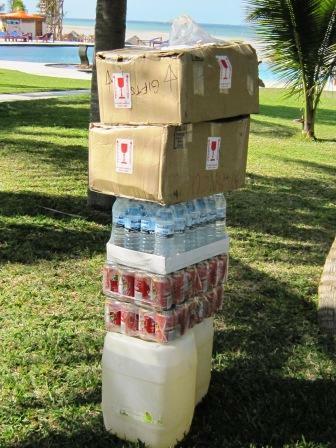 And our parcel, is now in Beira, which is further North in Moz, than we are! The couriers put it on the Intercity bus from Maputo to Beira, and the bus was supposed to stop on the highway at the Vilanculos turnoff and give it to the Vilanculos branch of their couriers. But when the bus stopped at the Vilanculos turnoff the driver promptly reported "that parcel is too far at the back and there is too much luggage to unpack before that parcel. I am already late so I will pack it towards the front, then when I return from Beira to Maputo tomorrow I will stop here again to hand it over." So where our parcels sleep tonight is unknown. It could be a bus shed, the bus drivers house, it could already be re-distributed to someone as a birthday gift. Who knows? Philip once said "in Africa anything is possible". It appears he knows the customary rituals better than I do. ! @#$%^&*$# - thats how I feel about it. So after hanging around the whole day we are still no further. 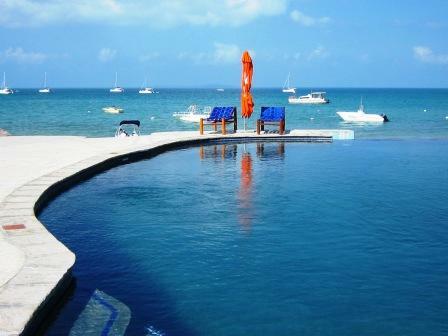 We have to extend our departure by 1 day and we have now moved 1 day into the good weather window that is available. We moved to the Benguerra anchorage at high tide, to close our tab at the lodge (Benguerra Beach Lodge) and say goodbye to our friends at the lodge. I recommend all yachties anchor here when arriving at the archipelago, the lodge has been extremely accommodating and the anchorage is excellent and exceptionally calm with good holding in sand. We will up anchor tomorrow morning at 5h30 (high tide) and move back to Vilanculos to do final provisions, collect our clearance certificate and parcel (positive thinking) and then proceed back here ready for departure on Saturday morning at high tide. Don't you just love it when a plan comes together! Granted it was not all part of the plan, but it all came together. The bus came, he stopped, we got our parcels. We got our clearance certificate all neatly prepared, with old fashioned carbon paper (we get the carbon copy) and we were able to do our last provisions for fresh produce at the local market (excellent quality and prices). I must add that Phillip (the Moz connection) really did pull a few strings to get us to this point. Its not what you know but who you know that counts. Any yachties out there proceeding in this direction, please email me for his number. You will be doing yourself a favour (and he speaks Afrikaans fluently if needed). One lesson we learnt is that when you go to the market there are 20 stalls all selling similar produce. Whilst you are at a stand (and there are no clear boundaries of where the stand starts and ends) busy making your choices (we always used Julio's stand) many others will leave their stall and come goods in hand to try to sell to you. This becomes very confusing as you are trying to select and order from Julio, he is trying to chase the other vendors nagging you away (which sounds like an argument), you saying no thanks to them in a bid to regain some order, as well as checking the weight of your purchases and agreeing to the price, all at the same time! This is a very taxing task. Oh, how I miss Pick 'n Pay online monthly grocery shopping. To retain your sanity, choose one vendor and order everything from him. 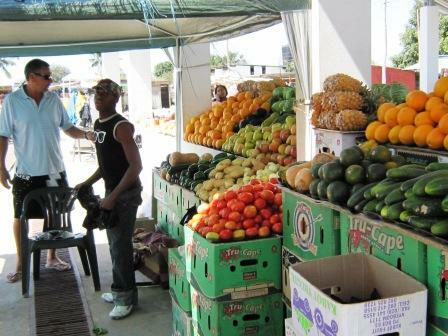 The market accepts Rands, and is very clean and safe. Should you want a receipt, add another 20 minutes to your time if you have brought your own calculator along, if not, longer. Not that that’s an issue when you are a cruiser! Moving on. It was quite an emotional two day roll for me as I felt the pangs of : now we are really going, because we are leaving the continent. You know, previously it was like being on holiday and just a quick 2 hour flight and you are back home. Whereas now, it feels like we are really starting to cruise. There is no longer going to be the backup I previously had, which was, logon to the net, pay and catch the next days flight home. Reality is that its just not going to be so quick and easy anymore. At the same time, we have also reached a sort of 'comfort zone' here, having met so many people and knowing the what, where's any how's of the town. I had to smile whilst we were driving through town today to get our last provisions. Kev was on the back of Phillips bakkie, and school had just come out. Every block or so, a kid would shout from the street at Kev "Hello Mister Kevin". He would respond by waving and having an typical African screaming conversation for as long as they were in earshot. We had become so comfortable that even the kids, that look after our tender (and there are lots) were greeting us. I made all my homesick prevention phone calls and emails and that's as prepared as I can get. Perhaps we have stayed a little too long in one place, and we both agreed that we should be more aware of this in future. Phillipa and Robert of Salty Dog came to bid us farewell. They are getting married in Cape town in 55 days and plan to sail back on the 1st. They have been such pleasant, jovial and helpful neighbours, that we will miss them sorely. We have very fond memories of times spent with them. We had a last late lunch at Vilanculos Beach Lodge, bade the lodge crowd farewell and headed back to Catatude in Landy ( she sure is comfortable!. We packed all our provisions away, lifted and stowed Lexy and Landy for the next leg of our trip and headed over to Benguerra where we will overnight before our 5am departure tomorrow morning at high tide. On recommendation of some of the well seasoned yachties, we have changed our routing and will not be stopping at Juan De Nova. It is in French territorial waters and they are reportedly not very accommodating, flatly deny anchorage rights and demand a Schengen territorial visa from anyone entering their jurisdiction. This visa obviously does not exist to anyone not involved in research! We will instead go to the Barren Islands after Bassas Da India as our second stop. I have added a new Page on our website called : Currently at. I will update this page every evening with our location as at 7pm that evening, to keep you informed of our progress. You will have to punch the co-ordinates into google earth if you wish to see where we are on a map, as the download time for a daily picture on the sat broadband will be too much. We are very, very happy with Catatude and are confident that she will take us safely through whatever weather may come our way. 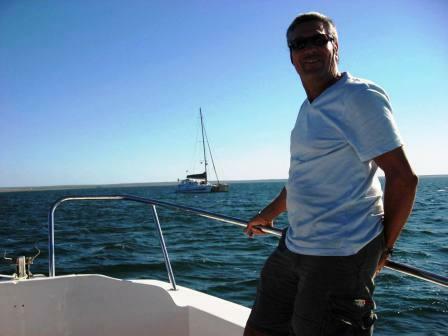 Kev from Knysna Yacht Co, you build a fantastic boat. After some of the horrific boat quality stories we have heard from fellow yachties whilst here, we are very pleased to know our boat is considered to be one of the strongest, fastest, best finished off boats available and with the bonus of outstanding after sales . After all, which boat-builder will collect spares from various different suppliers on our behalf, and ship them to us long after the sale has gone through? Thank you Kev ! Well, we are ready to depart (without Woolies heat ’n eat this time), stugeron at hand and a very favourable weather window. Vads, tell Mike to have the Chopper on standby incase the sea-sick monster arrives. Love you.